The Ultimate CMS for SEO's! 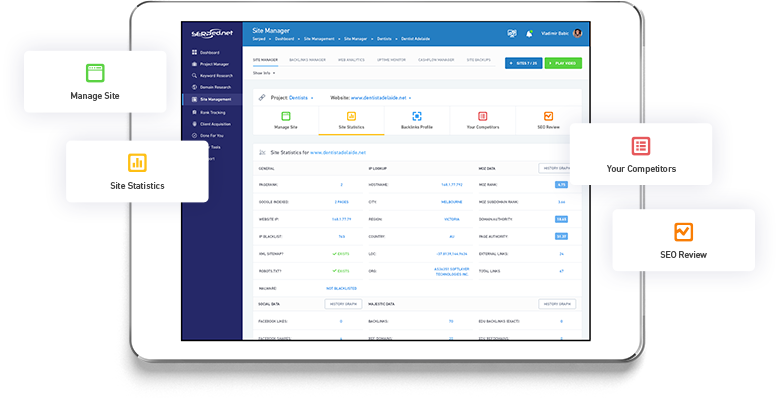 Manage ALL Your Sites From a SINGLE, User-Friendly Interface. Get rid of the spreadsheets, SERPed.net comes with an all-in-one solution to manage all your sites without hassle: your own sites, the sites of your clients... You will be able to keep track of all your posts, pages and links. Write notes, setup tasks with email reminders, check the status of your links: if they can be found, if they are indexed in Google or not, what anchor text they use, etc. Everything, from a SINGLE interface, enter it once, and get automated updates on Link Status. We automatically pull all the stats for not just your sites, but also you inner pages too. We constantly update this data for you to ensure everything is running as it is meant to. We also spider all the inner links of your site to present you with your 'internal link profile' so you can see what % of keywords are being used and what pages link where. This is an often forgotten aspect for SEO's, the 'on site inner linking' is a vital component and with SERPed.net CMS Site Manager, you can see all that with a click of a button. We also pull all your backlinks too, and show you your external backlink profile, anchor text cloud and update it for you. This allows you to be sure your backlink profile is clean, with high quality links and a good, diverse anchor profile. You can add your top 3 competitors and in an instant see how you compare across many metrics with our colour coded comparison charts that are updated regularly for you, as well as getting advise on your site with everything from speed, to on site optimization tips, custom tailored for your website. If you want to handle a lot of clients, or a lot of niche sites, you need to be organized, 99% of online business owners have no CMS, the ones who do use complex systems that are a pain to manually update. Not when you join SERPed… A highly Automated CMS solution to ensure you can handle 10 times the clients, without breaking a sweat!